This is the first in a series of blog posts which will highlight some of the new or improved features which will be available in the redeveloped SUNCAT. In this post we are going to focus on how the institutional and geographic limits will improve with the new service in comparison to the current service. Old SUNCAT: You can only select one institution and/or one location per search. New SUNCAT: Select as many institutions/locations as you like per search. Also, in the future, we hope to allow you to select and save your preferred group of institutions as your default search preference. We would also hope to set up some pre-selected groupings based on institutional consortia or geographic area. 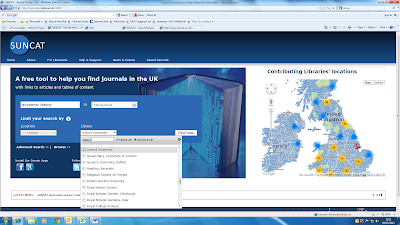 For example these might include UK Research Reserve (UKRR), Scottish Higher Education Digital Library (SHEDL) or Wales, North West England etc. Old SUNCAT: Only one location (normally the main library) is recorded for each institution on the service, so the geographical location limit is, therefore, not always exact. New SUNCAT: The new service records all of our contributing institutions’ physical libraries so limiting by location is now much more granular and precise. New SUNCAT: You can combine your limits to create very specific searches tailored for your individual requirements. For example, you can create a search limited to the location of “London” but then also include individual institutions outside London, e.g. University of Oxford. Old SUNCAT: Although a search with limits applied does only return titles held by that institution or within that location, holdings from other institutions/locations outside of the selected limits will also be displayed. New SUNCAT: Only holdings within the institutions or locations selected will be returned and displayed, creating a clearer more focussed result and record display. Naturally, the improved recording of institutions’ individual library locations and the improved functionality of the limits are both vital for the new SUNCAT mobile app which will also be released later this year. If you have any questions or suggestions about how the limits will work on the new SUNCAT or on the development in general, please contact us at edina@ed.ac.uk.